A man cycles towards a junction. At a steady speed, doesn't slow down, doesn't speed up. A large truck comes to a full stand still to let him pass. Cyclists on the cycle path have the right of way after all. The man passes, but the truck cannot drive on just yet. There is another cyclist coming and the long truck could never clear the junction in time. So the truck driver waits, until the junction is clear and no new cyclists approach it. Welcome to the every day reality of cycling in the Netherlands. The above scene is from a new video of the Netherlands' first cycle 'superhighway'. It's been almost two years since David showed you my videos of this "fietssnelweg" (fast cycle route) from Breda to Etten-Leur that was built in 2003 and finished in 2004. More fast cycle routes were built since this first one. I will try and visit some of them and make a series of videos to show you what the Dutch themselves consider state of the art cycling infrastructure. But a series wouldn't be complete without the first actual route so I revisited it. in the Breda - Etten-Leur cycle highway. We already showed and told you a lot about this route in the post of December 2009, but here is a quick recap of the most important facts. 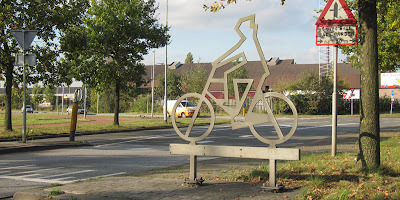 The route is over 7 kilometers or 4.5 miles long, from the center of Breda to the edge of Etten-Leur. Cyclists have priority on all junctions but one that is traffic light controlled. Costs in 2003: one million guilders per kilometer. Total costs amount to about 3.5 million euros. The route was financed by North-Brabant province (80%) and the city of Breda (20%). Width of the route at least 3.5 meters (11.5 ft) with a surface of smooth red asphalt. It has a consistent design, even for the lighting and the distance between planted trees. And: one observation tower, height 18 meters or about 60ft. Some things were striking since my last visit. Maintenance on this route is excellent. It still looks brand new even 7 to 8 years after it was completed. None of the newly planted trees uprooted the surface in any way. Also interesting: the design of the route is not special anymore. This route has set a standard (in width and surface) that has since been largely followed for cycling infrastructure around the country. And lastly Breda’s city limits were moved. I have no idea why, but the built up area of the city expanded to the west by one kilometer. This new video focuses on aspects that deserve some extra attention: the people using the route and the way the priority on the junctions works. There is a schoolrun and people going to the supermarket in the town of Etten-Leur. And at the junctions you can very clearly see how the interaction between motorised traffic and cyclists works in the Netherlands. Perhaps interesting to see that in this country motorised traffic is not automatically at the top of the traffic hierarchy. Yes, big trucks yield to children and elderly on a bicycle. I kept the original sound. So you can hear how quiet the route is once it is completely away from motorised traffic. Wow. Just wow. People did that. Well done Netherlands. I noticed that the bike path curved away from the road at the intersections. I later noticed that cars were able to stop there for the passing bicycles but still not block the road. Also cars were able to cross the bike path and have a place to wait to enter the road. I don't know of any superhighways for bicycles in the USA, but there are a few bike freeways being built along abandoned railroad corridors, or next to rivers. Los Angeles is building one along one side of the concrete flood control embankment of the L.A. river. This will enable people bicycling to avoid the 1,100+ feet elevation of hills that separate the San Fernando Valley from the rest of Los Angeles. Minneapolis's midcity greenway is a good example of using an abandoned railway corridor to make a bike freeway. Both of these examples use preexisting underpasses of bridges, to avoid intersections, driveways or railroad tracks. These are often not direct routes along heavily used corridors, but they are a way to travel by bike at a uninterrupted pace. The are also new standards being included in the federal manual of uniform traffic control devices, or MUTCD, like green bike lanes and wayfinding signs. Green paint or thermoplastic does not match the longevity of having coloring all the way through the asphalt, as is done in the Netherlands, but with few cities using coloring extensively on bike paths or lanes, there is not enough demand to move to the next level of having specialty equipment lay down colored asphalt. None of these will create the almost impossibly giant leaps to get to the heights of bicycling that the Netherlands is at. But like building a staircase, each step is helping towards that goal by creating more bicycling, which will in turn lead to more political will, and that in turn will enable more funding, which will perhaps lead to better quality, or more quantity of biking facilities. @Clark yes, you saw that very right. This is deliberate, so drivers can first give their undivided attention to the cyclists on the cycle path and once they have passed it, they can give their undivided attention to the rest of traffic on the road. And vice versa. Much easier and more safe for all. Over 30 years of experience in building cycling infrastructure gets you to build simple but clever solutions like these. wat meer racefietsers zien (zondagochtend ? ), anders denken de Yankies/Limies (sorry David) dat in NL alleen maar "rechtop" gereden wordt. Kijk met plezier naar jullie blog, met dank. This sort of blog is inspiring for those of us trying to get better facilities in England. It shows how well it can be done. Please have a look and add to your list if you like it! The 'problem' with many of these paths in the US is that they are mixed use ones, in contrast to what's found in the Netherlands by and large. This is not necessarily an issue, unless there are a lot of pedestrians and cyclists using it. Then it can become quite unpleasant. Furthermore they almost never get priority, even to side streets and driveways. And when they do the markings are so bad and/or people don't know/care about such markings that YOU must stop to avoid getting run over. We have one such trail called the St. Marks near Tallahassee, FL. Recently it was widened from 8 to 12 feet and repaved. Most of the time it is nice to ride on, but it suffers from the above-mentioned problems especially in the summer when joggers and walkers enjoy taking up the entire path and don't really know what the bike bell means the 1st 5 times it dings. Mixed-use paths really don't work well when volumes of both groups are high. Aproached that crossing at night when a truck was aproaching. I did slow down. Just to make sure I was seen. During the day I wouldn't but at night it's a lot harder to make eye contact. I was using lights so I was seen well in advance. But I noticed that about 50% of the other cyclist that night wasn't using lights. Most of them were riding with friends that were though. NAC had a home game so it was relatively busy. The neighbourhood at the end (from 9:47 in the video) was built in the early/mid 1980's so the paths are not as wide and smooth as the modern ones. If you went left at the end of the cycle highway you could use a smooth wide asphalt path that goes to the town centre. Built after the reroute of the A58 motorway end redevelopment of the towncentre in around 2000. Wonderful film Mark. Clearly a lot of work went into that. Thank you. I'm impressed by the lack of visual clutter in The Netherlands - few signs and virtually no billboards & advertising... at least not like what we see here. Is this due to the fact that so many people travel at 'human speeds' (ie. bicycle) so there is no need to grab their attention with large, ugly signs? @ Clark in Vancouver. Here in Ontario, and I assume it's the same in BC, bike paths actually curve toward intersections! That's because Canadian road designers have no experience designing bicycle paths, so they simply use the standard design for a sidewalk. In Ontario, it is a traffic offense to ride in a crosswalk, mainly because they are are so dangerous for bicycles. Cars have too many things to watch out for at the same time while making turns, so it's no surprise that it's so likely that a cyclist would get hit. Bicycle crossings have different markings from crosswalks, but they are laid out exactly the same. It's so frustrating that the Netherlands has such a simple solution to such a serious issue, yet no one is taking notice. I look forward to the time when Canadian bike facilities stop treating bicycles as cars (high volume mixed traffic, vehicular left turns...) or as pedestrians (mixed use paths), and acknowledge that they can build infrastructure that reflects the actual characteristics of bicycles. So qa cost of approx €500k per km if I read right - or approx £600k per mile. Compared to figure from Sustrans of £200k per mile that sounds like quite a lot, but they are largely using disued spaces - this is new road space, and I presume the usage rates are much higher than UK leisure routes. 3.5m width instead of London's 1.5m is something to note too! James, keep in mind also the standard to which these things are built. Not the same as Sustrans. Previously I found the price of a section of cycle-path alongside a road in the city. This was surprising inexpensive as well. Britain would do well to get Dutch companies to quote for work like this.